From common household electrical wiring to boat propellers and from photovoltaic cells to saxophones, copper, and its alloys are employed in a myriad of end-uses. In fact, the metal's use in a wide range of core industries has resulted in the investment community turning to copper prices as an indicator of overall economic health, spurring the moniker 'Dr. Copper'. In order to better understand copper's various applications, the Copper Development Association (CDA) has categorized them into four end-use sectors: electrical, construction, transport, and others. Aside from silver, copper is the most effective conductor of electricity. This, combined with its corrosion resistance, ductility, malleability, and ability to work within a wide range of power networks, makes the metal ideal for electrical wiring. Virtually all electrical wiring, save for overhead power lines (which are made from more lightweight aluminum) are formed with copper. Busbars, conductors that distribute power, transformers, and motor windings are also all dependent upon copper's conductivity. Owing to its effectiveness as a conductor of electricity, copper transformers can be up to 99.75 percent efficient. Another industry that is heavily reliant on the element is telecommunications. Finely twisted copper wires are used in ADSL and HDSL wiring for local area network (LAN) internet lines. Unshielded twisted pair (UTP) lines contain eight color-coded conductors, which are constructed of four pairs of thin copper wires. And despite the increase in wireless technology, interface devices such as modems and routers remain dependent on copper. The renewable energy sector has also benefitted from copper's conductive properties. The base metal is used in the production of both copper-indium-gallium-selenide (CIGS) photovoltaic cells and wind turbines. A single wind turbine, for example, can contain up to 1 metric ton (MT) of the metal. Besides the production of electricity, copper is also integral to the motors and distribution systems associated with alternative energy technology. Copper tubing is now the standard material for potable water and heating systems in most developed countries. This is in part due to its bacteriostatic properties, or in other words copper's ability to inhibit the growth of bacterial and viral organisms in water. 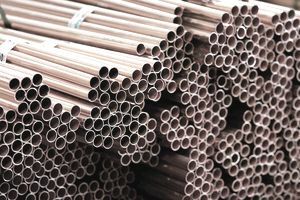 Other benefits of copper as a tubing material include its malleability and solderability — it can be easily bent and assembled — as well as its resistance to extreme heat corrosion. For hundreds of years, copper has also been used as an architectural metal. Some of the oldest examples of copper's use as an aesthetic, structural metal include the doors of the Precinct of Amun-Re at Karnak, in Egypt, which dates back 3000-4000 years, and the copper shingle roof atop Sri Lanka's 162 foot tall Loha Maha Paya temple, constructed in the third century B.C. Pure copper adorns the domes and spires of many medieval churches and cathedrals, and in more modern times has been used on government buildings, such as Canada's parliament buildings, and private residences, including many designed by Frank Lloyd-Wright. One reason for the wide use of copper as a construction material is its natural formation of a visually appealing green tarnish — known as patina — that results from the weathering and oxidization of copper. Aside from its aesthetically pleasing appearance, architects and designers prefer the metal because it is lightweight, durable, corrosion-resistant, and easy to join. Hospitals and medical facilities, in particular, value copper for its bacteriostatic properties, which has resulted in its growing use as a component of interior fixtures, such as faucets and door handles, in medical buildings. Core components of planes, trains, automobiles, and boats are all dependent on the electrical and thermal properties of copper. In automobiles, copper and brass radiators and oil coolers have been the industry standard since the 1970s. More recently, the growing use of electronic components, including onboard navigation systems, anti-lock braking systems, and heated seats, has continued to increase demand for the metal from this sector. Growing demand for hybrid and electric cars will further increase global copper consumption. On average, electric cars contain roughly 55lbs (25kgs) of copper. Metal foils and copper chemicals are incorporated into both nickel-metal hydride and lithium-ion batteries that power fuel-efficient vehicles, while cast copper rotors have been used as an alternative to rare earth magnet motors. High-speed trains can use up to 10MT of copper per kilometer of track whereas powerful locomotives contain as much as 8MT of the base metal. Overhead contact wires for trams and trolleys like those used in San Francisco and Vienna are made using copper-silver or copper-cadmium alloys. Two percent of an airliner's weight can be attributed to copper, which includes as much as 118 miles (190km) of wiring. Because of their excellent resistance to saltwater corrosion manganese- and nickel-aluminum bronzes are used to cast boat propellers that can weigh up to several tons. Ship components, including pipes, fittings, pumps, and valves, are also made with similar alloys. Cookware and Thermal Applications: Copper's thermal properties make it ideal for cookware, such as pots and pans, as well as air conditioner units, heat sinks, calorifiers for water heating and refrigeration units. Clocks and Watches: Because it is non-magnetic copper does not interfere with the operation of small mechanical devices. As a result, watchmakers and clockmakers use copper pins and gears in the design of timepieces. Art: Copper and its alloys are also commonly seen in works of art, perhaps the most famous of which is the Statue of Liberty. The statue was plated with over 80 tons of copper sheet, attached with over 1500 copper saddles and 300,000 copper rivets, which results in her green patina color. Coinage: Until 1981, the US one-cent piece — or penny — was minted mostly of copper (95 percent), but since that time has been minted as copper-plated zinc (0.8-2.5 percent copper). Musical Instruments: What would a brass band be without copper? Brass is used to produce horns, trumpets, trombones, and saxophones because of the resistance to corrosion and anti-bacterial properties of copper.